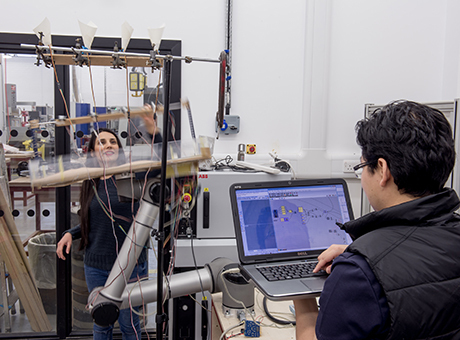 Three fully-funded PhD fellowships in design communication, simulation and robotics are available at The Bartlett School of Architecture as part of InnoChain, an innovation European Training Network funded by the EU’s Horizon 2020 programme. InnoChain (Building Innovation in the Extended Digital Chain) is a four-year international research network for highly motivated doctoral researchers, in which state-of-the-art research is combined with a comprehensive training and an industrial secondment programme. Details about the Bartlett InnoChain PhD fellowships are summarised below. The deadline for all applications is 11.59pm on Thursday 7 May 2015. Alternate Means to Communicate Measure Lead (ESR 5) examines how complex design solutions with multiple criteria can be managed and communicated with non-expert stake holders across the design chain. Simulating Robotic Feedback (ESR 10) explores digital fabrication strategies that incorporate real-time feedback between robotic control and mechanical or compositional changes in the material. Applied Robotics - Controlled Material Deposition (ESR 13) will propose fabrication processes that grade material deployment (fibre placement and concrete printing) within building elements for the purpose of varying structural and environmental properties. InnoChain is funded by the European Union’s Framework Programme for Research and Innovation Horizon 2020, under the Marie Skodowska-Curie Actions Innovative Training Network scheme. The research network assembles a highly cross-disciplinary team of experienced researchers drawn from six European research institutions and 14 leading industry partners.